Igor Lah’s Team CEEREF led this first event of the 2019 44Cup from the outset to be most worthy winners. On the final day neither they nor Vladimir Prosikhin’s Team Nika won a race, but showed impeccable consistency, both enjoying a trio of podium place results, elevating Team Nika from fourth to second overall. The Bay of Tivat came good for the final day of the 44Cup Porto Montenegro with three races held. Saturday’s opening race got underway in light conditions, but eminently race-able by the nimble RC44s. In this Chris Bake’s Team Aqua won the pin and then match raced Team CEEREF for the duration, ultimately finishing ten boatlengths ahead. In the second race Kirill Frolov on Bronenosec Sailing chose the favoured left and followed Team CEEREF at the top mark. Then John Bassadone’s Peninsula Petroleum took the right side of the run to claim the lead. Finally on the next upwind Bronenosec edged ahead, led at the top mark and on to the finish. 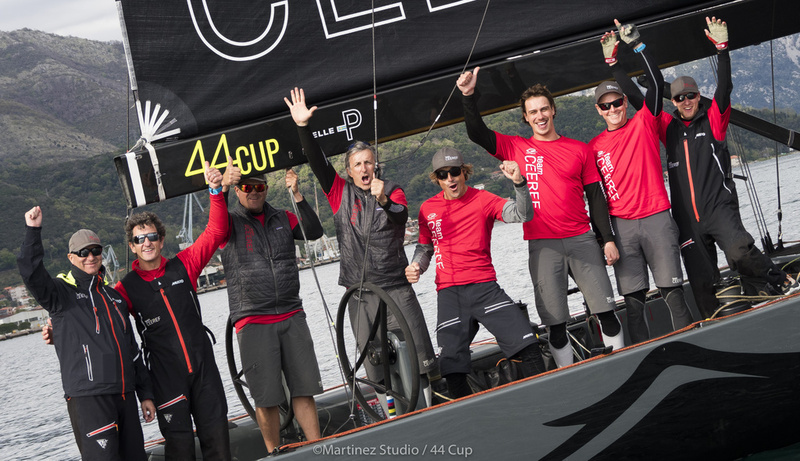 Team CEEREF’s victory at the 44Cup Porto Montenegro was by seven points from second placed Team Nika, in turn two ahead of Team Aqua, with Peninsula Petroleum relegated to fourth after a disappointing final race. Incredibly even though Lah’s team won the seasons in both 2016 and 2017 and came close last year, the 44Cup Porto Montenegro is their first event win since the World Championship in Sotogrande three years ago. While the fleet racing is over, Sunday a Pro-Am race will be sailed on a long distance coastal course, the nine RC44 sailing more guests on board than usual.